By DONNA BALANCIA — SeaWorld Entertainment Inc. said its parks set an attendance record during the October-through-December period and the company expects to report its highest annual revenue ever. The news comes amid continued reaction to the film ‘Blackfish,’ about Tilikum, the killer whale who killed its trainer Dawn Brancheau at Orlando SeaWorld in 2010. SeaWorld said its three flagship marine parks in San Diego, Orlando and San Antonio together posted their best Q4. The company did not disclose exact numbers. The company says its annual revenue was $1.46 billion, which will be formally released in March. The company said its adjusted earnings before interest, taxes, depreciation and amortization will fall within the range of between $432 million and $442 million for the year. 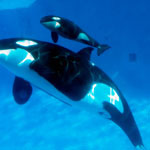 This entry was posted on January 13, 2014 by News in Producer Donna Balancia and tagged California Tourism, Dawn Brancheau Foundation, San Diego Vacation, SeaWorld, SeaWorld Entertainment, SeaWorld Entertainment Quarterly Earnings, SeaWorld Orlando, SeaWorld Parks, Shamu, Tilikum.